Patti Rundall, Co-Chair, IBFAN’s Global Council. GAIN now claims that it disbanded its Business Alliance in December 2013 - just 3 months after GAIN launched a new Business Platform for Nutrition Research in New York in September. The Alliance is still featured on the GAIN website along with the logos of member companies: Pepsico, Coca Cola, GlaxoSmithKline, Cargill, Kraft Foods, Hershey’s, Tate & Lyle and Brittania and DSM (a manufacturer of ingredients of breastmilk substitutes). GAIN’s Board also contains representatives from food companies, such as Brittania and Renata. The Business Alliance apparently merged with - or was 'folded into" the SUN Business Network (SBN) at the Davos World Economic Forum this week, to be “overseen by an Advisory Group made up of business and including civil society” - which of course includes GAIN. NEW! CLICK HERE for WHO's paper mapping its engagement with Non Sate Actors. This week, GAIN sponsored a nutrition feature in the Guardian with a headline: “Empowering pregnant women to seek out fortified foods” – cleverly replacing “advertising to” with “empowering”. This strategy of promoting fortified foods and supplements, not only creates major market opportunities but can undermine women’s confidence in breastfeeding and sustainable family foods. It can also undermine small farmers and smallholders in the developing world, who play a critically important role in ensuring local food security. 5. it is misleading, confusing, or could lead to inappropriate use. 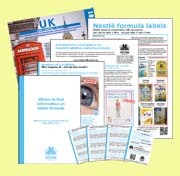 Promotional claims about micronutrient ingredients and other inappropriate marketing of baby foods contribute to poor rates of exclusive and continued breastfeeding and, when such products are high in sugar, can increase obesity, an underlying factor in the risk for non-communicable diseases (NCDs). Such promotion can also undermine confidence in local foods and harm local food security. Formulas and supplements for nursing mothers, can also undermine confidence in breastfeeding. Entities such as ISDI, Croplife International, ILSI and the Industry Council for Development are currently in official relations with WHO even though they represent the private commercial sector and are guided by market profit-making logic (whose PRIMARY interest clashes inevitably with that of WHO). Conflating the ‘not-for profit’ status and the ‘not working in the interest of profit-making’ is one of the key reasons why such entities gained NGO status. With assets of $61million, GAIN claims to work with 600 companies and civil society organisations. “GAIN’s goal is reach 1.5 billion people with fortified foods that have a sustainable nutritional impact.” Following complaints from IBFAN GAIN has now ‘divorced’ from the baby food manufacturer Danone. However, because GAIN is focusing on the first ‘1000 days’ many other global food companies who market foods and supplements for infants, young children and nursing mothers are members of GAIN. IBFAN considers that it is a misnomer for GAIN to be listed as an NGO and accepted into official relations with WHO when it has such a commercial objective. Indeed this would go against WHO's current valid NGO policy. The Standing Committee is composed of 5 member states: Malaysia, Myanmar, Namibia, Panama and Lebanon.